Brian and Dharmesh recognized that the way people buy products and services had changed. People were doing independent research on the Web, and companies needed to adapt in order to reach them. Ten years ago I also recognized how the world was changing. At the same time as HubSpot was founded, I was writing the first edition of my book The New Rules of Marketing and PR, which was published in its first edition June 2007. I saw that the traditional ways of marketing and reaching the media were increasingly less effective and I offered a roadmap for reaching people in more effective ways through online content. You have to realize that ten years ago, we were complete radicals. There were only a handful of people talking about what marketers needed to do in order to reach buyers in the new world. The entire planet was still marketing in the traditional ways (spending huge budgets on advertising) and there were very few companies focused on reaching buyers directly by publishing content for free. It's odd to think that a decade ago we lived in a world where Facebook, Twitter and the iPhone weren't household names. Twitter had been founded just 3 months before and the first generation iPhone was yet to be released. Facebook was only in dorm rooms at the time – it was still months away from being available to those without an .edu email address. At the time, it wasn’t so obvious that marketing success would come from a new approach. At the time, people would actively fight our thesis that marketing needed to fundamentally change because buyers were making independent decisions based on Web content. We were met with skepticism and sometimes outright verbal hostility, frequently from vested interests in traditional advertising agencies. Fortunately, fate brought us together. As we talked, it became clear quite quickly that we were in complete alignment. This was remarkable at the time since almost every other marketer on the planet hadn’t seen the new world coming. In that first meeting we decided to collaborate and I joined the company’s advisory board where I have served for nine years (so far). I distinctly remember one of the early discussions around how to position the company. Was HubSpot a new company in an established marketplace? Or was the company doing something completely new? From my point of view, the most important early decision HubSpot made was to pour time and effort into defining a new category called “Inbound Marketing”. It was a brilliant move in hindsight, but not so obvious at the time. Brian and Dharmesh argued that cold calling, e-mail blasts, and direct mail were turning consumers off to an ever-greater extent, so consumers were increasingly doing research online to choose companies and products that meet their needs. Inbound Marketing recognizes these behavioral changes as opportunities, and explains how marketers can make the most of this shift online. This not only addresses turning strangers into website visitors, but explains how best to convert those visitors to leads, and to nurture those leads to the point of becoming delighted customers. This was very different than the marketing approach widely used at the time. Back then, the small HubSpot team correctly surmised that if they focused their fledgling promotional efforts on the idea of Inbound Marketing - rather than just talking about the HubSpot marketing platform - they could educate potential customers about how marketing has changed. That effort would take longer and perhaps be more risky than a product pitch, but would yield a bigger payoff if it worked. Soon after, the INBOUND conference was established. Rather than make the event exclusively for HubSpot customers and partners, which is the norm for many companies, the team decided to make the annual gathering inclusive of everyone who wanted to learn about modern marketing. This clever move further solidified the idea that Inbound Marketing was a movement and HubSpot was leading the charge. INBOUND has been held every year since and INBOUND 2015 attracted more than 14,000 attendees. While I’ve spoken at INBOUND every year, I particularly look forward to meeting people and attending the sessions. 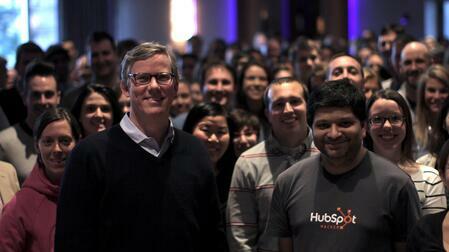 There’s no doubt that Inbound has become a movement. In 2014, HubSpot (the company) moved into the sales marketplace as well, creating products and services that help people sell. Now, HubSpot (the product) is an inbound marketing and sales platform that helps companies attract visitors, convert leads, and close customers. The Inbound movement now includes both marketing and sales. Today, more than 19,000 customers in more than 90 countries use HubSpot’s software, services, and support to transform the way they attract, engage, and delight customers. I’m one of those happy customers, with this blog as well as my primary website and my Newsjacking website all on the HubSpot platform. Since going onto HubSpot several years ago, I have seen the number of visitors to this blog and my sites grow quickly and the leads I generate from my online content double. HubSpot now employs more than 1,300 people and besides its Cambridge, MA headquarters, it has offices in Dublin, Ireland; Singapore, Sydney, Australia; and Portsmouth, New Hampshire. I'd like to offer personal congratulations to Brian and Dharmesh for founding such an awesome company. I am honored to be a part of the continuing journey and am eager to see what the next decade will bring.